Children usually don't appreciate how much their teachers do for them. Their teachers work hard to give them all kinds of new discoveries. But often, young students do little more than grumble and complain every step of the way. Now of course, as adults we look back on our childhood teachers, and we understood how good it was that we didn't have to learn our lessons on our own. We're grateful for all they did for us. But when you think about it, we should be even more grateful for the countless opportunities our childhood lessons have given us to learn more and more every day of our lives. In many ways, that's how it is when it comes to the meaning of Scripture. God didn't leave us to discover the meaning of Scripture on our own. He provided guides to help us. But more than this, one of the most remarkable things about the Bible is that as we go through our lives, we can return to the Bible over and over and always learn more about its meaning. This is the sixth lesson in our series He Gave Us Scripture: Foundations of Interpretation, and we've entitled it "Discovering Meaning." In this lesson, we'll focus on some hermeneutical strategies that can help us figure out the original meaning of Scripture. Countless factors contribute to the process of discovering meaning in the Bible. But for our purposes, we'll draw attention to just two. First, we'll talk about some important guides that help reveal the significance of a biblical text. And second, we'll see the value of making multiple summaries of that meaning. Let's begin by looking at the guides that point us toward Scripture's meaning. In an earlier lesson, we mentioned that most evangelicals today refer to their general hermeneutical strategy as the grammatico-historical method. Now, this terminology is relatively recent, but it represents an approach that can be traced back throughout church history, especially from the time of the Reformation. In effect, the grammatico-historical method seeks to discover the meaning of Scripture in terms of the grammar of Scripture — what's written on its pages — and in terms of its ancient historical context, especially the context of its human authors and audiences. These grammatical and historical factors serve as guides to discovering the meaning of Scripture. In this lesson, we'll focus on three main guides that help reveal the significance of a text in Scripture: the writer of the text, the document itself, and the original audience for whom the text was written. When the Holy Spirit inspired the writings of Scripture, he worked through the talents and personalities of the writers. So, knowing something about the writers can help us understand the things they wrote. The Holy Spirit also crafted each book as an integrated whole, providing enough written content for each passage to be understood within its own grammatical and literary context. So, the document itself can guide our interpretation since it contains the literary context in which all its passages should be interpreted. And the Spirit made sure that the books he inspired would make sense to their original audiences and be relevant to their lives. So, we can also learn something about the meaning of Scripture by exploring the identities and lives of its original readers. Imagine a man in a restaurant who finds a note discarded on the floor. The note has just one word scribbled on it: "HELP!" He shows the note to his friends at the table to see if any of them can figure out what it means. But there just isn't much to work with. "I wish there were more words," the man complains. "If we just knew who wrote it," another adds. And another friend comments, "I wish there were some way to know who was supposed to get this note." The fact is that the note could mean a lot of things. It could be part of a game children were playing at another table. It could be a request for help with the menu. It could be a desperate cry from someone in serious trouble. Without further guidance, there's simply no way for the man and his friends to understand what the note really means. And something similar is true about the Bible. When we know little or nothing about its authors and audiences, or when we read passages without knowing their broader context, the Bible's intended meaning will be unclear to us. But the good news is that any knowledge we gain about the writer, the document or the audience has the potential to improve our understanding of Scripture's meaning. Our discussion of the guides that help reveal the significance of a biblical text will divide into four parts. We'll begin by looking more closely at each of the guides: the writer, the document, and the audience. And we'll conclude this section by exploring their interdependence. Let's look first at the guidance offered by the writer. Whenever we consider the human author of a portion of Scripture, we have to be ready to answer all kinds of questions. First, we want to know the identity of the author. Who was he? At times, the Scriptures actually identify the author of various books by name. For example, the Old Testament books of Amos and Isaiah are directly attributed to the prophets Amos and Isaiah. The New Testament epistles of Peter and Paul explicitly name these apostles as their authors. But at the same time, many books in the Old and New Testaments, like Judges and Kings, as well as Acts and Hebrews, are anonymous. In these cases, we often have to settle for some general observations about authorship. But whatever the case, to one degree or another, general historical research and the Scriptures themselves always enable us to create a profile for every biblical author. We can always gain some insights into questions like these: What role did the author have among the people of God? What were his special interests? What kinds of concepts, behaviors and emotions did he emphasize in his book? And everything we know about a biblical author guides us toward the goal of discovering the meaning of Scripture. This passage makes it clear that John's overarching purpose was to call his readers to "believe that Jesus is the Christ, the Son of God, and that by believing [they] may have life in his name." When we have some knowledge of the writer and his purpose, it isn't difficult to see this same twofold goal in John 3:16. Most editors of modern translations rightly consider John 3:16 as the beginning of John's comments on the words of Jesus that end in John 3:15. The first half of John 3:16 states that, "God so loved the world that he gave his one and only Son." This portion of the verse corresponds to the first half of John 20:31: "that you may believe that Jesus is the Christ, the Son of God." And the second half of John 3:16 states, "that whoever believes in him shall not perish but have eternal life." This portion of the verse corresponds to the second half of John 20:31: "that by believing you may have life in his name." Noting these parallels verifies something that many interpreters have recognized for millennia. John intended this passage as much more than a mere factual, historical statement. The historical fact that God gave his unique Son Jesus was important to John, but his real purpose in mentioning it here was to call his audience to saving faith in Christ so that they could have eternal life. As we can see, understanding John's purpose and beliefs, helps us interpret his gospel more appropriately. Having considered the benefits of relying on the writer as a guide to the meaning of Scripture, let's turn our attention to the biblical document. Our use of the word document will include all the features of the text we're studying, including its vocabulary, grammar, figures of speech, sentence structure, formal structure, the outline of its argument, the surrounding literary context, and so on. To interpret Scripture responsibly, we must pay close attention to the actual words and phrases the inspired author wrote. One of the most important things to remember when we explore a biblical document is that it conveys its meaning in units of different sizes. Now, these various units of meaning are different in different genres, but in general terms, meaning is conveyed by morphemes, which are small features of words that indicate things like singular and plural and verbal tenses. Meaning is also conveyed through words, then phrases, clauses, sentences, paragraphs in prose, and stanzas in poetry. Larger sections like whole narratives, speeches or law codes and even entire books serve as units of meaning. And interestingly enough, the meaning of smaller units becomes clearer in the light of larger units. And the meaning of larger units becomes clearer in the light of smaller units. So, anytime we want to see how a biblical document guides us toward its meaning, we have to be ready to explore it on all of these levels. To illustrate what we mean, let's look at a facet of John 3:16 that's often misunderstood. As we saw earlier, John 3:16 begins "For God so loved the world…" It's quite common for evangelical Christians to take this phrase to mean something like: "For God so greatly loved the world…", "For God so dearly loved the world…" or "For God loved the world so much…" This understanding of the opening of John 3:16 is so longstanding and widespread that many of us never even question whether or not John meant for the word "so" to be taken as "so greatly," "so dearly" or "so much." But when we look at John 3:16 in its larger context, it soon becomes evident that this isn't the significance of the word "so." In these verses Jesus set up a comparison between the time when "Moses lifted up the snake in the desert" and the time when "the Son of Man" — Jesus himself — "must be lifted up." In verse 15, Jesus referred to Numbers 21:4-9 where God punished Israel in the wilderness by sending poisonous serpents against them. The people of Israel cried out for deliverance. And at God's command, Moses made a bronze serpent, put it on a pole, lifted the serpent into the air, and all the Israelites who looked to the bronze serpent were healed. By this analogy, Jesus made it clear that as he is lifted up, all people everywhere who look to him will be saved from God's judgment. It's important to note here that Jesus said, "Just as Moses lifted up the snake … so the Son of Man must be lifted up." In this comparison, the Greek term translated "so" is the same word that appears at the beginning of verse 16, the word houtōs. Jesus said that just as the serpent was lifted up, "thus," or "in the same way," the Son of Man must be lifted up. And John picked up this comparison when he used this same term in verse 16. In effect, John repeated the word, houtōs, to make a second comparison with Moses lifting the serpent. But in verse 16, the comparison is between what Moses did and what God did when he gave his one and only Son. Or as we may put it, "Just as Moses lifted up the snake in the desert … in the same way God loved the world [and] gave his one and only Son, that whoever believes in him shall not perish but have eternal life." This example illustrates just one small way that carefully considering the document of a biblical text helps us understand its meaning. With this understanding of how the writer and the document serve as helpful guides to interpretation, we're ready to consider the audience as a third guide. Whenever we consider the original audience of a portion of Scripture, we have to be ready to ask all kinds of questions. First, we want to know the identity of the audience. Who were they? At times, the Scriptures tell us explicitly who the audiences were. For example, the New Testament epistle of Romans identifies the audience as Christians living in Rome. Galatians identifies the churches of Galatia as its audience. But at the same time, most books in the Old and New Testaments don't directly identify the audience. And in these cases, we must settle for indirect clues. In all events, to one degree or another, general historical research and the Scriptures themselves always enable us to create a general profile of the original audiences. We must do all we can to answer questions like these: Where did the audience live? What were their historical circumstances? What challenges did they face? What conceptual, behavioral and emotional needs did they have? Everything we know about original audiences guides us toward discovering the meaning of Scripture. Although the original audience didn't directly contribute to the writing of Scripture, biblical writers usually composed their books with original and secondary audiences in mind. They wrote for some people directly, but they also wrote for others who would be exposed to their books indirectly. This was because when the Scriptures were first written literacy was the privilege of only a few. So, biblical authors didn't expect very many people to actually pick up their books and read them. Still, the more we know about the primary and secondary original audiences, the better we're able to investigate the original meaning of biblical passages. The Samaritan woman said to [Jesus], "You are a Jew and I am a Samaritan woman. How can you ask me for a drink?" (For Jews do not associate with Samaritans.) (John 4:9). The Jews had decided that anyone who acknowledged that Jesus was the Christ would be put out of the synagogue (John 9:22). In this passage, to "be put out of the synagogue" was to be excommunicated, excluded from the life of the Jewish community. Not only can we assume that John's audience included Gentiles and people from outside of Palestine, but it seems clear that his audience was also facing a crucial challenge. One clue to this challenge appears in the fact that John used the terminology "the Jews" as a way of referring to those who opposed Jesus and his followers. This theme is so prominent that some interpreters have argued that this gospel is anti-Semitic. Of course, Jesus, John and the rest of Jesus' apostles were Jewish, so this was no mere reference to ethnicity. Rather, John had in mind Jews who didn't believe in Jesus and persecuted the church. The frequency with which John referred to unbelieving Jews as opponents of Jesus and his followers strongly suggests that John's audience was also facing persecution for their faith. And John's gospel often addresses the reasons that unbelieving Jews rejected Jesus and the converts to Christianity. For our purposes, we'll mention just two. Why then do you accuse me of blasphemy because I said, "I am God's Son"? (John 10:36). As this verse indicates, Jesus' claim to be the Son of God was one of the main reasons the Jews rejected him. We know that this man really is the Savior of the world (John 4:42). From John's point of view, Jesus was not just the Savior of the Jews but "the Savior of the world." The importance of these two themes for John's original audience helps explain passages such as John 3:16 where John stressed that Jesus is God's "one and only Son" and that the Father sent him because "God so loved the world." Now that we've considered the ways the writer, the document, and the audience can serve as guides to the meaning of Scripture, let's turn our attention to their interdependence. In order for us to interpret the Bible responsibly, it's very important for us to understand that each of the guides we've mentioned informs and is informed by the others. Our knowledge of the author helps us understand his document and original audience. The things we know about the audience help us understand the writer's intentions and the nuances of his document. The document's words and grammar give us information about the writer and the audience. So, as interpreters, we need to gain as much guidance as possible from all these sources, so that our readings of Scripture aren't skewed by an imbalanced emphasis on just one or two of them. The writer, the document, and the audience are interdependent guides to meaning. If we fail to account for their interdependence, it's very easy to fall into error. If we overemphasize the author, we often fall into an intentional fallacy. An intentional fallacy relies too heavily on what we think we know about a writer and his intentions, and de-emphasizes the things we learn about the document and audience. There are many ways to commit intentional fallacies in biblical interpretation. For instance, we might make unwarranted assumptions about an author's intentions by speculating about what he was thinking when he wrote. Or we might overemphasize valid information about a writer by wrongly assuming it was very relevant to the text we're interpreting. Let's illustrate some possible intentional fallacies by looking at John 3:16. We can be sure that when John wrote this verse, he intended to draw his readers' attention to the love of God shown in the death of Christ. But we can't be sure of all the subtle, psychological influences that motivated John to write these words. Scripture and reliable history simply don't give us enough clues about John's inner thoughts to draw these types of conclusions. And even if we could, his inner thoughts might not be particularly relevant to the meaning of John 3:16. A second type of mistake we can make is overemphasizing the document. This kind of error is often called a graphic fallacy. The term "graphic" comes from the Greek word graphē, which means "writing." Correspondingly, the graphic fallacy overemphasizes the document itself, to the relative exclusion of contextual considerations like the writer and audience. This is a fallacy, or mistake, because the same document can mean very different things depending on who wrote it and for whom it was written. We might commit this fallacy by thinking that we can sufficiently grasp the meaning of a passage merely by analyzing its vocabulary, grammar, and structure without regard to its author or original audience. In our example from John 3:16, think about what could happen if we focused exclusively on the document and ignored John and his original audience. How would we know who God's Son was? After all, this verse doesn't explicitly identify him. If readers didn't know that John was a Christian and that he wrote to a Christian audience, they might make all sorts of irresponsible assumptions. A pagan worshipper of the Canaanite gods might think that the "son of God" was Baal, the son of the Canaanite god El. Someone familiar with the fact that Adam is called the "son of God" in Luke 3:38 might wrongly conclude that Adam is the Son of God in John 3:16, or even that Adam and Jesus are the same person. Other readers might be confused by terms like one and only or world, or the concept of eternal life. There are many mistakes we can make when we ignore the writer and the audience. A third type of interpretive mistake we can make is overemphasizing the audience. This is often called an affective fallacy because it focuses too heavily on how Scripture affects its audience. This fallacy is often committed when an interpreter speculates too much about the mindset of the original audience, and fails to pay enough attention to the writer and the document. It's certainly legitimate to consider Scripture's effects on its original audience, as well as things we learn about the audience from reliable history. But the affective fallacy goes beyond this by overemphasizing the audience's personal reactions to the text, and almost always results in subjective, unreliable readings of Scripture. For example, in John 3:16, the affective fallacy might speculate too much about the original audience's circumstances and response to John's teaching about eternal life. It might suggest that when John talked about life, what he really meant was earthly escape from the persecution his original audience was enduring and not a spiritual renewal and blessing that we enjoy forever. This interpretation would overemphasize the passage's impact on its audience, ignoring John's broader teaching and the details of the document itself. Sadly, mistakes like the intentional fallacy, the graphic fallacy and the affective fallacy are easy to make — especially when we don't have very much information about some of the guides. And the truth is that we can't always know much about the writer or audience of a text. Many biblical books are anonymous, and many don't explicitly identify their audiences. And sometimes we even lack important information about the document. We don't always have access to resources that help us understand all its features, like the implications of the way things were stated in the original languages of Scripture. When our information is more limited, it's generally wise for our interpretations to be more generalized. Even so, when we properly account for the interdependence of the guidance we receive from the writer, the document and the audience, everything we learn from any of these guides has the potential to improve our interpretations. So far in our discussion of discovering meaning, we've addressed three important guides to meaning. So, now we're ready to turn our attention to the value of making multiple summaries of the meaning of biblical texts. If you've been in the church long enough, you've probably heard more than one pastor preach from the same biblical text. And often the sermons are very different. As a matter of fact, it's possible to preach different sermons, very different sermons, from the same text without violating its meaning. How can this be? Simply put, no mere human interpretation of the Scriptures can be complete or exhaustive of its meaning. There's always more to learn. And for this reason, we must always look for new ways to summarize biblical passages so that we can further our understanding of what they mean. Normally a summary will come from a particular vantage point or emphasize a particular concept that appears in the passage. Since every passage has a complex meaning, summaries help us by narrowing our study, allowing us to focus on just a portion of what the passage has to say. We can illustrate the concept of a summary by thinking about a group of students that watches a complex, dramatic play. After the presentation, the students are asked to summarize the meaning of the play. One student summarizes the play by describing how the characters developed throughout the story. Another summarizes the events in chronological order. Still another describes the way the playwright was criticizing cultural values of the day. And finally, one student describes how the beautiful staging and expressive language affected him personally. All of these responses are legitimate summaries of the presentation's meaning. But none of these summaries completely captures the play's full meaning. If we were looking for the full meaning of the play, we would need to include all these summaries and more. But that's one of the reasons that making multiple summaries is so useful — it helps us focus on individual aspects of meaning, and it also allows us to learn more and more of the play's full meaning. And the same thing is true of Scripture. There can be many legitimate ways to summarize the meaning of a passage in the Bible, and these summaries can help us better understand aspects of its meaning. And taken together, multiple legitimate summaries bring us closer and closer to the passage's full meaning. We'll consider three main factors that illustrate the benefit of making multiple summaries of Scripture's meaning. First, we'll look at the complexity of the passage. Second, we'll mention the uniqueness of the interpreter. And third, we'll focus on the needs of the audience for whom the text is summarized. Let's start by exploring the complexity of the passage. As we learned in an earlier lesson, the complexity of Scriptural passages is largely due to the fact that their original meaning, or literal sense, is multifaceted, like a cut gemstone. They have facets representing things like historical facts, doctrines, moral obligations, salvation and eschatology. Every text of Scripture communicates moral implications for our thoughts, words and actions. Every text teaches us something about history and salvation, and helps form our hopes and expectations regarding the future. And each of these things that a passage communicates can be used as the basis for a summary. In fact, because Scripture's meaning is multifaceted, we can summarize it in many different ways and still be true to its literal sense. Scripture's complexity implies that our summaries will never be exhaustive, and that we can always make more summaries that are both true and distinct. The Lord says to my Lord: "Sit at my right hand until I make your enemies a footstool for your feet." (Psalm 110:1). The New Testament frequently quotes Psalm 110:1. But each time it focuses on a different aspect of the original meaning. And none of the quotations contains everything that other verses say about the psalm's original meaning. For instance, Jesus quoted it in Luke 20:41-44 to show that the Messiah must be more than simply David's son. In Acts 2:32-36 Peter used it to demonstrate that Jesus was both Lord and Christ since he was David's heir that had ascended to a heavenly throne. The New Testament also recognizes that the words of Psalm 110:1 are spoken to David's Lord; therefore, many New Testament passages use Psalm 110 to refer to Christ's reign on earth. Ephesians 1:20-22, 1 Corinthians 15:25 and Hebrews 10:13 all summarize this aspect of the psalm's original meaning with reference to the present reign of Christ until he returns. Hebrews 1:13 even uses it to demonstrate that Jesus' authority is superior to the ministry of angels. Each of these New Testament references to Psalm 110:1 is faithful to the original meaning of the psalm. But each is also an incomplete summary of that original meaning, and has a distinct emphasis. This is possible because of the complex, multifaceted original meaning of the verse. In fact, the same thing is true of every passage of Scripture. Every text leads to multiple legitimate summaries. And the summaries that are most valuable to us vary from place to place, time to time, and person to person. Not every summary of Scripture is equally valuable or legitimate. But there are many summaries of the original meaning of biblical passages that are faithful and useful for the church in every age. Now that we've seen how the complexity of the passage can lead us to multiple summaries, let's turn our attention to the uniqueness of the interpreter. In an earlier lesson, we advocated using an authority-dialog approach to the meaning of Scripture. You may remember that an authority-dialog model acknowledges that objective truth can be found in the text of Scripture as long as the methods comply with biblical standards. One valuable aspect of an authority-dialog model is that it highlights the fact that all interpreters come to biblical writings with different sets of concerns, assumptions, backgrounds and questions. Each of us reads Scripture differently because God has gifted each of us differently. We all have strengths and weaknesses, and we process information in a variety of ways, based on our unique knowledge and experience. God has designed his church so that we each can benefit from the strengths of others. People's gifts and backgrounds lead them to summarize biblical passages in distinctive ways. For instance, an historian may summarize the meaning of Genesis 1 differently than an artist. The historian might describe the order in which God created light and dark, water and dry land, and plants and animals. But an artist might talk about the beauty and goodness of the stars in the night sky, and the fish and birds throughout the world. The personal strengths of the interpreters lead each to bring out important but different aspects of the passage's original meaning. At the same time, both types of summaries can also be hindered by the interpreters' weaknesses; each one omits important truths that the other includes. Let's assume, for example, that we want to understand the nature of God, and we choose to begin by exploring Genesis 1. If we read the historian's summary, we see that God is an organized planner, but we may overlook the delight God took in his creation when he declared in Genesis 1:31 that creation was "very good." However, if we focus solely on the artist's summary, we may see God as flawlessly creative but ignore his intentionality and orderliness. These potential weaknesses help us see that no summary should be ignored simply because it's not the same as ours. In many cases, we can learn a lot about a passage from other peoples' summaries. Having looked at the ways the complexity of the passage and the uniqueness of the interpreter make multiple summaries possible, let's consider the needs of the audience. There are many legitimate ways to summarize this verse. We could create a summary that focused on peace, or on the fact that Jesus reveals truth to us. But let's assume we need to summarize it for an audience that's dealing with suffering. First, we would need to look at the reason for the suffering. Some Christians suffer because they endure persecution from unbelieving political authorities. Others suffer from poverty or natural disasters. Others suffer as a result of unwise or even sinful behavior. And there are other causes of suffering, too. Because of these vast differences in our own experiences, no single summary will responsibly apply the teachings of John 16:33 to all these different audiences. For example, summarizing the passage for an audience suffering persecution might look like this: Be encouraged because Jesus will eventually end your persecution and establish a world in which you will never be persecuted again. But to those suffering from poverty or a natural disaster, the summary may look like this: Jesus has permitted your suffering for a time, and will eventually bless you in ways that more than make up for the losses you've experienced. In general, we can all be encouraged by the fact that Jesus has overcome the world, and we can all hope to find peace in the midst of sufferings. But since we all suffer from different troubles, we have to adapt the complex teaching of this passage in different ways in order to minister to the needs of different audiences. And there are cultural differences that we should take into account, too. Each culture has a different history, different societal structure, different competing religious viewpoints, and different strengths and weaknesses. In order to apply the Bible in the most helpful ways, we need to find summaries of Scripture that minister to the needs of specific people in their own specific circumstances. When we interpret the Bible, we should always have in mind both the original meaning of the passage and the needs of our contemporary audiences. In many ways, the investigation of Scripture is all about bridging the distance between the original meaning and our contemporary audience, so that we can all benefit from the full value of biblical texts. None of us can do this perfectly. But we can trust that the Holy Spirit will lead us to biblical summaries that minister to his church in valuable ways. 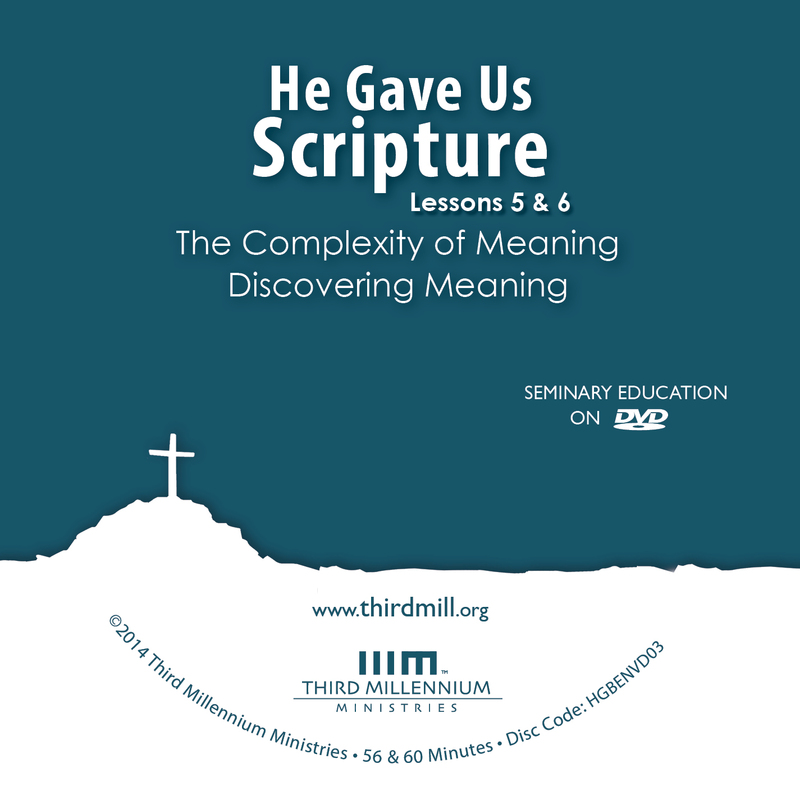 In this lesson on discovering meaning: we've focused on two main ideas: the important guides to meaning we find in the writer, document and audience of Scripture; and the multiple summaries we can make from Scripture. We all have to admit that sometimes the Scriptures are difficult to understand. But the good news is that God has given us a variety of ways to discover the original meaning of his Word. He's given us the documents of Scripture themselves, and these documents contain the grammatical and literary context we need. And he's also provided us with ways of gathering information about the writers and the original audiences of Scripture. And beyond this, the original meaning of every portion of Scripture is so rich that we can gain new insights into it every day of our lives. If we keep these things in mind as we study the Bible, we'll be able to discover more and more about the original meaning of Scripture.